Have you ever been to an Ugly Christmas Sweater Party? I’ve heard about them for ages, but I’ve never been invited to one, nor have I hosted one myself. I went to Target to check out their Ugly Christmas Sweater selection in the men’s department and I was pretty surprised by what I found…they were so cute! After seeing the hilarious and adorable Ugly Christmas Sweaters in the Target Men’s collection this morning, I think I might have to finally host an Ugly Christmas Sweater party! They are just adorable! I could totally throw an Ugly Christmas Sweater party and wear a sweater like this, right? But honestly, I’d keep wearing it afterwards because hello…cats and bling? That’s right up my alley! It looks really cute with skinny jeans and suede boots! You too can Go from “meh” to “merry” with @Target! There’s an entire line of fun stuff at Target in the men’s section that will inspire you to get decked out for the holidays, and there’s fun gifting options too. Aside from the Ugly Christmas Sweaters at Target, they also have fun socks to match! The silly gift ideas don’t stop at sweaters and socks, of course! 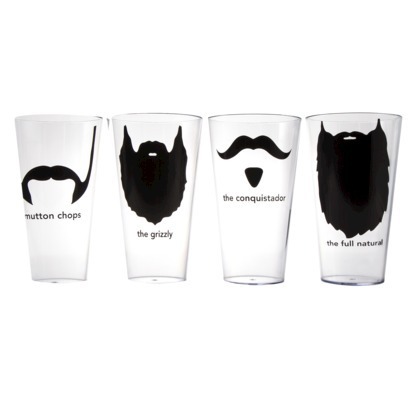 These fun mustache pint glasses are perfect for gift-giving, or if you’re anything like me, you can buy them as a gift for someone and then just keep them for yourself! Go check out the fun Target stuff – it’s all on sale this weekend! « Get Your Copy of Disney Planes Blu-ray Combo Pack in Time for Christmas! Just ordered a bunch of stuff from Target. It’s one of my favorite stores. I want to have an ugly sweater party, too. That’s one ugly sweater! If it just had the cat with the hat & meow, that would be cute. They’re hilarious! I’m totally going to check them out next time I head to Target. They’d be awesome for a White Elephant Gift Exchange! Omg I totally want to throw an Ugly sweater party! I have never been to an ugly sweater party, but it seems like an interesting way to spend an afternoon. those are cute. and i’d wear it. not with sparkly red leggings, but with jeans? yep. I saw this sweater on a guy and thought, “That really IS one ugly sweater!” Yet, the same sweater on you looks cute! Seriously. I am so planning an ugly sweater party. I love Target, and this is such a cute idea. My kids would love to rock one of those ugly Grinch sweaters. Am I the only one that thinks that cat one is CUTE? I don’t think it’s ugly at all! I had no idea Target had an ugly sweater section, that’s cool. The Christmas party I’m attending this week is having an ugly sweater contest but I don’t have one. HAHAHHAAH Love it, that gold chain is Hilarious!!!! Thanks for the laugh!! Might have to get one of these to rock it like you :-D!!!! Lol! OMG that is great and you totally rock that sweater big time! I’m going to have to swing by Target to check out the selection! these are AWESOME. i would pay money to get my hubby in one! I don’t wear ugly sweaters but my daughter does. I think she’d like the skull one. Those ugly sweaters are so much fun! I’ve never been to one, but it seems fun. Once I caught my daughter and her bff sneaking out one of my Christmas sweaters to wear to an ugly sweater party. Truthfully, the cats and the bling are a winning combo. YOu and him look pretty good in those “ugly” sweaters!!! I remember going to an Ugly sweater party – what fun! I’ve seen the best ugly Christmas sweaters at Target this year! Love that that they’ve been embracing the concept this year. That’s awesome! I actually needed an “ugly Christmas sweater” and did not have one!!! Ha! I love it! I may have to get one…I’d love to host a party! I have never been to a ugly sweater party either but I bet they are hilarious! 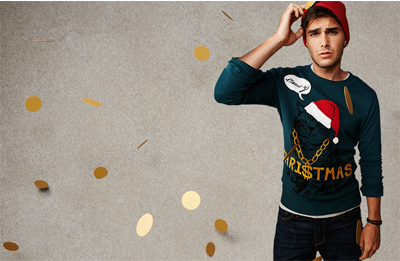 I think it’s fun that companies are embracing the “ugly sweater” trend and just making sweaters to fit the bill. I’ve never been to one of those parties, but my brothers love going. omg I totally want that cat santa hat wearing sweater, it is awesome! Haha. Never been to one or hosted one. But I would totally go and wear an ugly sweater. They are awesome. These sweaters are too funny. I wish they did them for Hanukkah too! I actually want to start an ugly sweater tradition with my family this year. Such a cool idea and I think the sweaters are awesome!